– Sts Augustine & Monica, by Ary Scheffer, 1846, please click on the image for greater detail. Bishops have had a tough decade, as have all the ordained. Some would say, of the guilty, deservedly so, by their or their predecessors own action/inaction. We are ALL sinners, most especially, yours truly! Sins of commission and omission. The Catholic understanding of sin is that it is never a private affair. All sin, even unknown sin, is a social offense. The first tragedy, the victims of clergy sexual abuse, and, a second, I dare suggest, are the innocent ordained, who have dedicated their lives in service and love, try as they may with the aid of grace, in service to the Lord and His People. God bless them! Their reward will surely be great in Heaven for having lived, and served, and loved in this time. Bless them! And, thank you! How much harder it must be to live out the life of service and love in these days! Rejoice! I say again, rejoice! 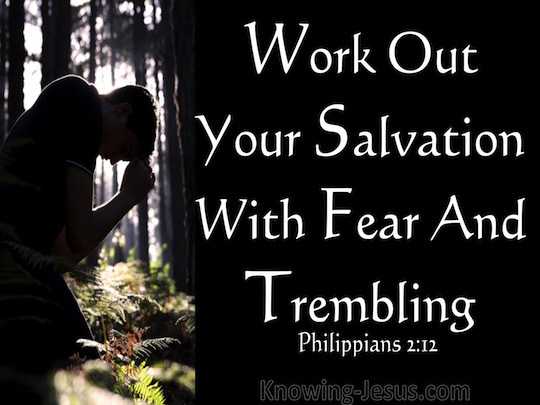 You shine as examples of Christian fortitude, fidelity, the power of grace and commitment! True servants of the Lord! I know I am inspired by your example! Thank you! God bless you! Thank you for your service and your love, for your fidelity and example which inspires us all in, of, and for Love! 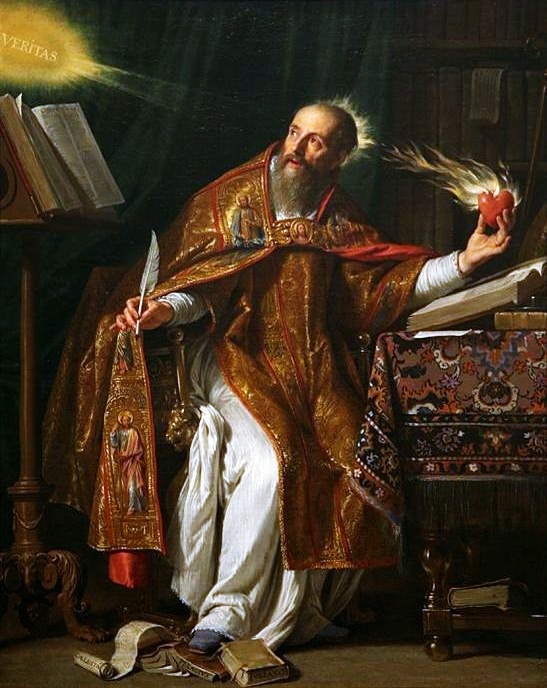 Accepted by most scholars to be the most important figure in the ancient Western church, St. Augustine was born in Tagaste, Numidia in North Africa. 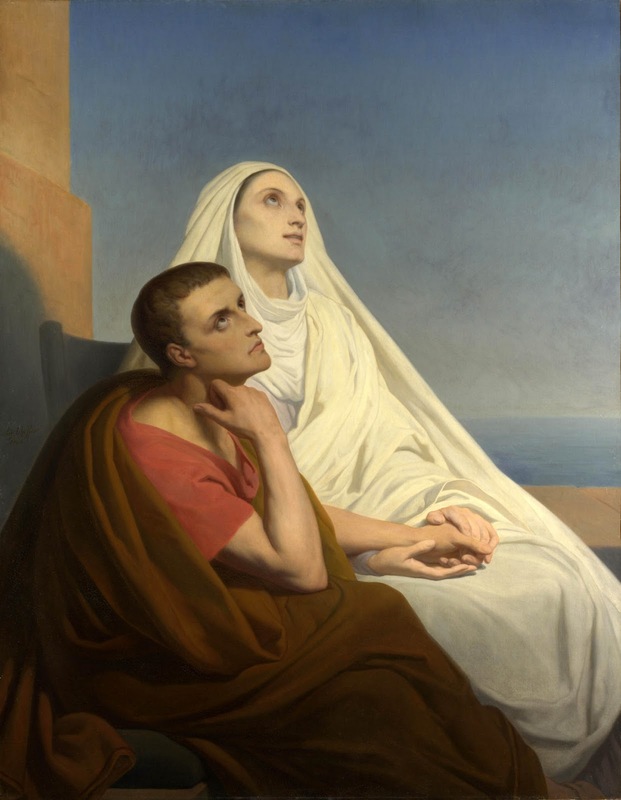 His mother, St Monica, was a Christian, but his father remained a pagan until late in life. After a rather unremarkable childhood, marred only by a case of stealing pears, Augustine drifted through several philosophical systems before converting to Christianity at the age of thirty-one. At the age of nineteen, Augustine read Cicero’s Hortensius (now lost), an experience that led him into the fascination with philosophical questions and methods that would remain with him throughout his life. After a few years as a Manichean, he became attracted to the more skeptical positions of the Academic philosophers. Although tempted in the direction of Christianity upon his arrival at Milan in 383, he turned first to neoplatonism. During this time, Augustine fathered a child by a mistress. This period of exploration, including its youthful excesses (perhaps somewhat exaggerated) are recorded in Augustine’s most widely read work, the Confessions. This famous son of St. Monica was born in Africa and spent many years of his life in wicked living and in false beliefs. At age 17, through the generosity of fellow citizen Romanianus, Augustine went to Carthage to continue his education in rhetoric. Although raised as a Christian, Augustine left the church to follow the Manichaean religion, much to the despair of his mother, Monica. As a youth Augustine lived a hedonistic lifestyle for a time, associating with young men who boasted of their sexual exploits with women and urged the inexperienced boys, like Augustine, to seek out experiences or to make up stories about experiences in order to gain acceptance and avoid ridicule. 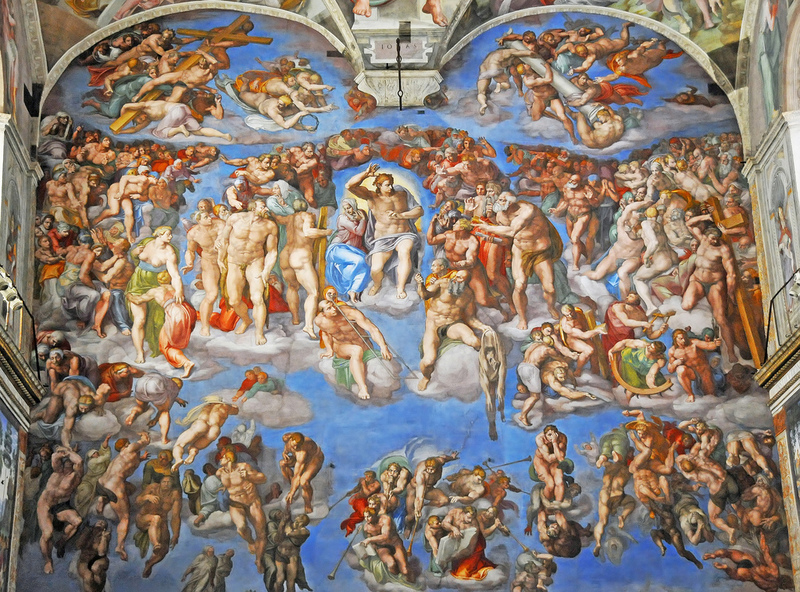 It was during this period that he uttered his famous prayer, “Grant me chastity and continence, but not yet!” – “da mihi castitatem et continentiam, sed noli modo.” At a young age, he began an affair with a young woman in Carthage. She was his lover for over thirteen years and gave birth to his son Adeodatus, who was said to have been extremely intelligent. Full of bitter sorrow, Augustine flung himself out into the garden and cried out to God, “How long more, O Lord? Why does not this hour put an end to my sins?” Just then he heard a child singing, “Tolle, lege! 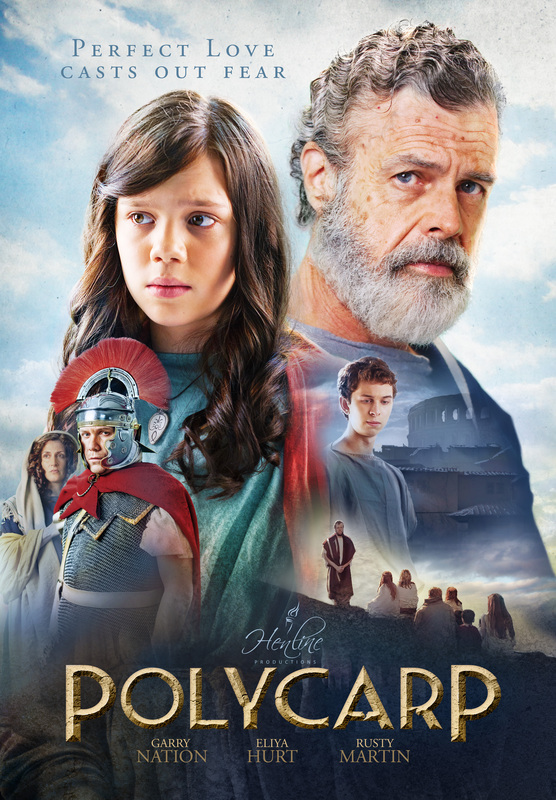 = Take up and read!” Thinking that God intended him to hear those words, he picked up the book of the Letters of St. Paul, and read the first passage his gaze fell on. “Not in riots and drunken parties, not in eroticism and indecencies, not in strife and rivalry, but put on the Lord Jesus Christ and make no provision for the flesh in its lusts'”[Rom 13:13-15]. “I neither wished nor needed to read further. At once, with the last words of this sentence, it was as if a light of relief from all anxiety flooded into my heart. All the shadows of doubt were dispelled.” — The Confessions of Saint Augustine, Book VIII, Paragraph 29. 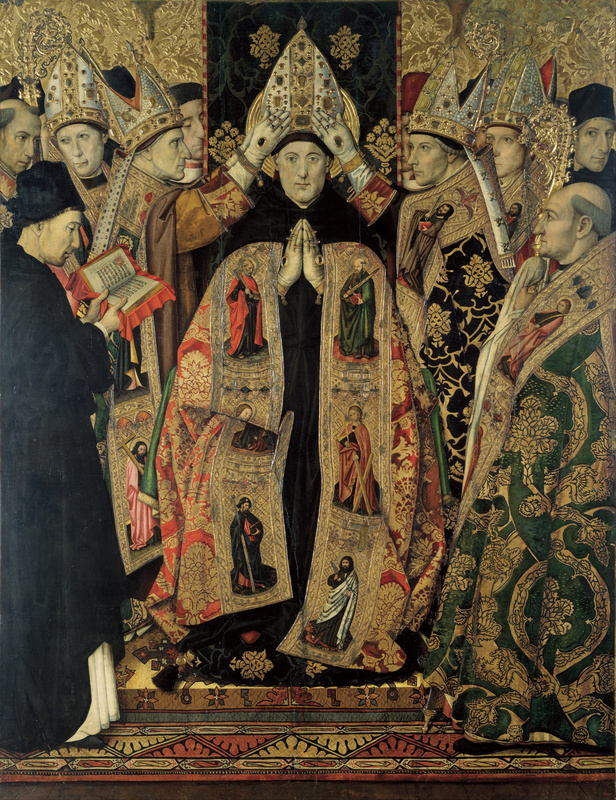 During his youth, Augustine had studied rhetoric at Carthage, a discipline that he used to gain employment teaching in Carthage and then in Rome and Milan, where he met Ambrose who is credited with effecting Augustine’s conversion and who baptized Augustine in 387. Returning to his homeland soon after his conversion, he was ordained a presbyter in 391, taking the position as bishop of Hippo in 396, a position which he held until his death. Besides the Confessions, Augustine’s most celebrated work is his De Civitate Dei (On the City of God), a study of the relationship between Christianity and secular society, which was inspired by the fall of Rome to the Visigoths in 410. Among his other works, many are polemical attacks on various heresies: Against Faustus, the Manichean; On Baptism; Against the Donatists;and many attacks on Pelagianism and Semi-Pelagianism. Other works include treatises On the Trinity; On Faith, Hope, and Love; On Christian Doctrine; and some early dialogues. Give me yourself, O my God, give yourself to me. which is not my God is utter want. Amen. Come to me, glory of the living, and hope of the dying. that I may always be pleasing to you. Amen. Sola fides? Are you Saved? I’m working on it. I hope so. “Many Catholics, especially those living in the South, have heard the question posed by Protestants. Unprepared by the Church to properly answer, they often shrug off the question or walk away. But Catholics should not only respond, they ought to engage their questioners in discussion. That’s the position of Dr. C. Colt Anderson, dean of Washington Theological Union in Washington, D.C., and the featured speaker March 10 at St. Thomas Aquinas University Parish’s third annual theology lecture. He continued, “Ask yourself: Am I more faithful now than I was a year ago? Do I have more hope? Am I more loving now than I was?” Catholics must constantly be increasing in faith, hope and love, Anderson said. “It’s not enough to think kind thoughts about hungry people. We must do something for them,” he explained. And what about loving all people? “We have to love the worst people. … We should love racists … violent people … greedy people because Christ came and loved all of us,” Anderson continued. Just as individuals have different talents and gifts, so may the graces they receive differ, Anderson said. As an example, he noted that St. Francis of Assisi called himself the worst sinner in the world. A follower disagreed, pointing out the good Francis had done. The Italian saint demurred, saying that if the worst sinner got the grace I’ve got, he would have done a better job with it. “Good things come from God. Sins are ours, but we don’t want to give them up,” Anderson continued. Asked for his thoughts on purgatory, Anderson said he doesn’t know what purgatory is, but it may be a place where “unfinished business has to be dealt with.” Sins are forgiven but there may still be lasting damage from those sins that must be addressed. “You’re given absolution from your sins but you’ve done damage. … Some effort has to be made … Unfinished business has to be dealt with before you get into heaven,” he said. Traditionally, Catholics have been taught to pray for the dead in purgatory — until now. “We haven’t taught this generation to pray for us,” he said.